I think I’m going to go insane – because I’m gonna CHOOSE it! Creative collaboration with my mom . . .
because I’m gonna CHOOSE it! these burdens I now bear. you’ll find me locked in there. with a great big minty grin. shouting “Glory to the King”! wheels her cart on by. But what if they suspect? What if they have me tested? they’d know that I was mad! and I guess I’ll always be! 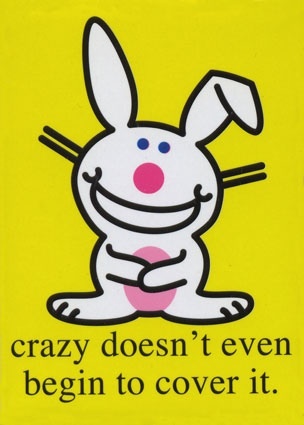 We’re all a little crazy. Embracing it helps keep the remaining sanity alive!